Dell Venue 10 Pro (5056) Rear Camera Module- OEM Rear Camera unit for the Venue 10 Pro (5056) tablet; this is the camera for the back or rear side of the Tablet. 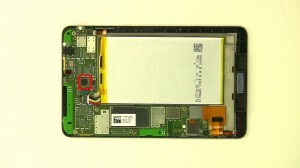 We have made the installation of your Dell Venue 10 Pro 5056 Camera a simple DIY project. Just follow our step by step instructions. We have written and video installation tutorials available. Save time and money by doing your own Dell laptop repair.